Three months back I bought an iPhone 3GS at a bargain price. iPhone 3GS is one of the best smart phones available in the market and when it comes to user experience there is simply no competition. The only downside is its high price in India. Within a week of buying it I dropped it! The internal LCD had cracked and within few days, grey lines started appearing on the display (see photo). It was clear that within weeks the entire LCD will turn into a grey display. After a bit of googling I found that it is possible to change the LCD on my own. The only problem was how to get it. That is when ebay came to the rescue. There are plenty of sellers in ebay.com who can do international shipping for iPhone 3GS LCD repair kit. The LCD kit also contains all the tools required for replacement. 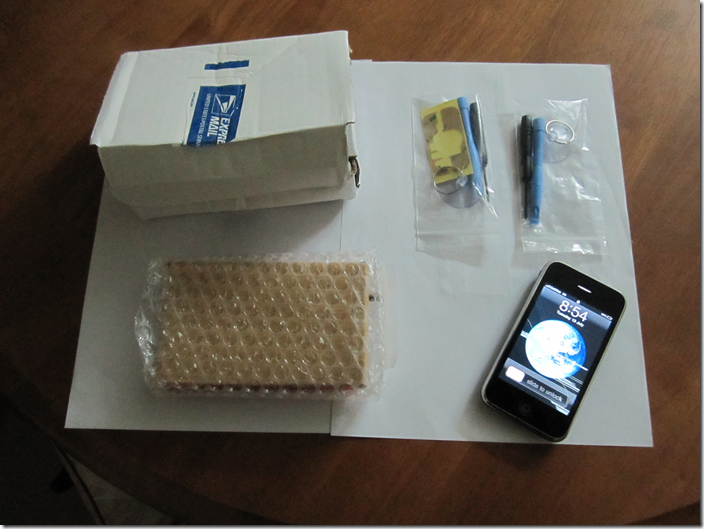 I ordered an iPhone 3GS LCD kit from ebay and I got it within 10 days. Now all I had to do was to follow the iPhone 3GS LCD replacement DIY videos on YouTube or use one of the DIY photo guides. However the replacement was not as easy as I thought. 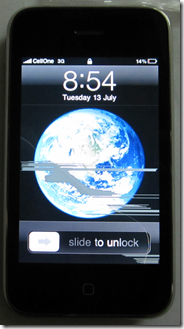 The most important thing to remember is that a slight mistake could mean the complete destruction of your phone. So you need to be slow, steady and patient. I used the iPhone 3G LCD replacement instructions provided by iFixIt.com. The procedure is almost identical for iPhone 3GS. Here are some of my own notes on the instructions given in the above link. Do the replacement during daytime. It is really a nightmare to work under fluorescent lamp. Step 2 is very critical. When you use suction cup never apply too much force as it will rip away the internal cables. Apply increasing pressure and vibrate slightly to get the display detached from the body. In step 9 you peel away a thin black strip. Don’t forget to put it back after changing the LCD panel! The above tutorial is incomplete at Step 13. After getting the LCD out, you need to separate the LCD screen from the metal piece. They are glued together. Use a thin screwdriver to gently separate them. Then attach the metal piece to the new LCD screen (after peeling away screen protectors). Never touch the LCD screen once you remove the protective covering. When putting things back, it is a bit cumbersome to connect the cables. It might take a while to get the Cable 1 back in position. Apply pressure so that it gets locked. The replacement LCD is not as good as the original factory fitted LCD. The seller claims it is OEM LCD, but I doubt it. The joy of fixing a costly Smartphone on my own – priceless! Just replace jayson.in with jaysonjc.com in the URL.